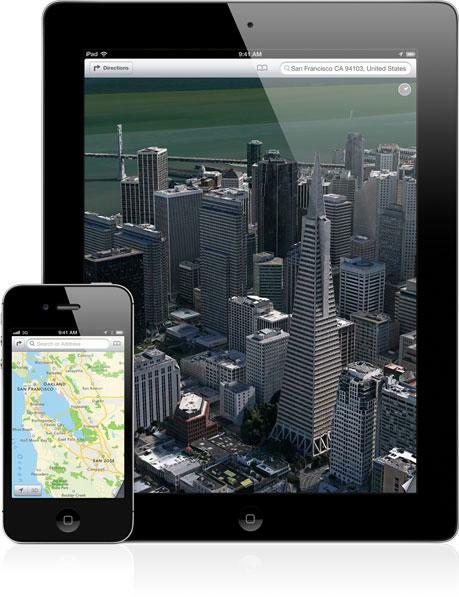 Apple's new mapping software in iOS 6 marks an attempt by the iPhone maker to further marginalize its rival, Google. By taking away a significant source of traffic, Apple hopes it can help push Google quite literally off the map. Back in 2007, Apple debuted its original iPhone Maps app as a touch driven interface for exploring Google's extensive and free online maps, but as Google subsequently introduced Android as a competitive threat, Apple has rethought its dependance upon the Google partnership for iOS maps. Since the debut of the original iPhone, Apple has adopted new features of Google maps, including traffic reports, transit directions and StreetView. However, as Google continued to roll out many other mapping features that strategically supported its various advertising businesses, Apple began ignoring them. Apple's iOS doesn't support Google's Maps Navigation features, nor does it incorporate support for Google's Loopt-like Latitude or its Yelp-like Places features that are all integrated into Android's version of Google Maps. Instead, Apple began working on its own maps server for iOS 6 (pictured above), a significant undertaking given the years Google has invested in improving its market leading map services. Google has previously faced competitive challenges from others, including Microsoft's Bing, but Microsoft now has virtually zero presence in mobile devices. Additionally, Microsoft just skates to where the puck is, making it easy for Google to maintain a comfortable lead just by remaining in motion. Apple, on the other hand, accounts for more than half of all mobile devices, including the majority of tablets with iPad, a virtual lock on iPod-like music players, and a commanding presence in smartphones. More importantly, Apple isn't just planning to replace Google's maps in iOS. It is launching plans to deliver significantly better mapping services, something that will force Google to work hard to keep up.